If you’re looking for dance, just look up! A pioneer in aerial dance, the Oakland, CA-based BANDALOOP seamlessly weaves dynamic physicality, intricate choreography and the art of climbing to turn the dance floor upside down. Founded by choreographer and artistic director Amelia Rudolph, BANDALOOP’s work has been presented in theaters and museums, on skyscrapers, bridges, billboards and historical sites, in atriums and convention halls, in nature or on cliffs, and on screen. 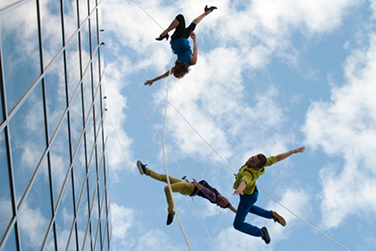 BANDALOOP honors nature, community and the human spirit by bringing dance to new audiences, activating public and natural spaces, and re-imagining what dance can be. For more information about BANDALOOP, visit www.bandaloop.org.